Presumptive Republican presidential nominee Donald Trump addressing the crowd at the May 7, 2016, Trump political rally held at the Northwest Washington Fairgrounds in Lynden, WA. Lynden Mayor Scott Korthuis is shown on the right. The photo is from a video posted on YouTube, featuring a full replay of the rally. The information in this report is intended as a resource. It is comprised of my communications (via email and phone conversations) with some of the local elected officials and Lynden city officials, who were involved in the decisions which led to the Trump campaign rally being held at the Northwest Washington Fairgrounds. CORRECTION 6/30/2016: The “over $155,000” figure referenced in the report below includes Whatcom County and Western Washington. More than $129,000 of that cost was specific to Whatcom County agencies; police and fire departments, emergency management, and the Port of Bellingham. 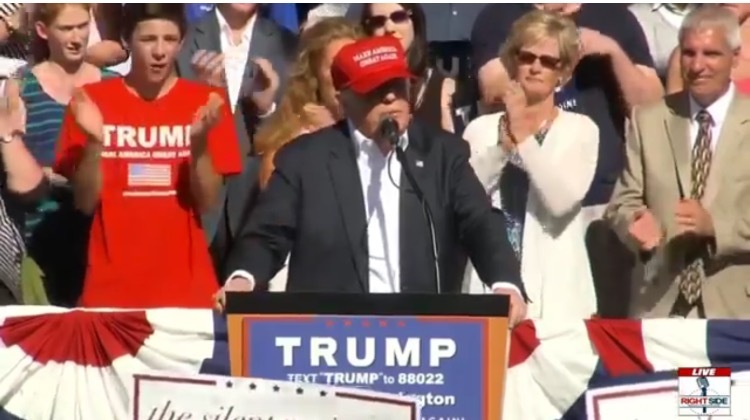 Lynden, a small city in Northwest Washington, about 5 miles south of the U.S.-Canadian border, was the location chosen by presumptive Republican presidential nominee Donald Trump, and his campaign, for his May 7, 2016 rally. The selection of the Northwest Washington Fairgrounds in Whatcom County, as the rally venue, was reported to have been decided at the last minute. Washington state Senator Doug Ericksen (R-Ferndale, WA), is the Deputy Director of Donald Trump’s campaign in Washington, and was the apparent connector that brought the Trump campaign to Whatcom County. Because of what appears to have been a hasty decision made by Lynden Mayor Scott Korthuis, Whatcom County Sheriff Bill Elfo, the Northwest Washington Fair Association (its Manager Jim Baron), and Lynden’s City Administrator Mike Martin, the Trump rally was held in Lynden with less than 48 hours notice. Such an extraordinary event required the utilization of approximately 300 law enforcement and emergency responders, which, so far, has totaled over $155,000. That figure is only for Whatcom County and the cities within it. There were other costs incurred by other agencies and those costs are not included in the total. 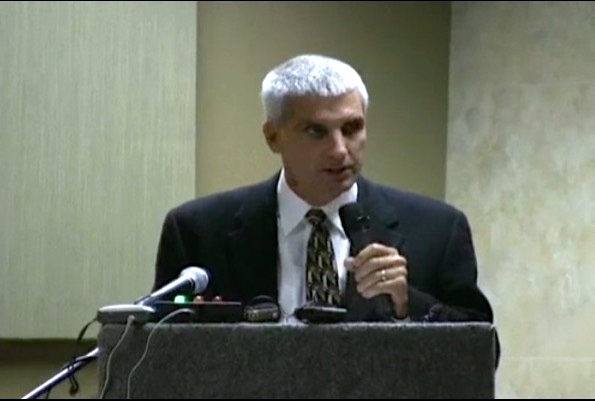 Lynden Mayor Scott Korthuis testifying at the November 29, 2012, EIS scoping hearing for the Gateway Pacific Terminal project, held in Ferndale, WA. Mayor Korthuis and the other decision-makers listed above, used the Lynden city ordinance which amended the Lynden Municipal Code (LMC) to provide an exemption for the Northwest Washington Fair from needing to obtain special events permits, and used the concept of law enforcement mutual aid, as vehicles for allowing the Trump rally in Lynden. To all appearances, that political rally is a significantly different event than what is typically held at the Fairgrounds. A case could be made for interpreting that language to mean the Fair itself, which is held annually in the summer, and that would include any activities/events held on the Fairgrounds during that particular annual Fair event. The specific language in the LMC did not state “The Northwest Washington Fairgrounds,” or “The Northwest Washington Fair Association,” which is the organization that owns the Northwest Washington Fair. Had one, or both, of those two entities been specifically referenced instead, perhaps that would have warranted a broader interpretation of that statute. However, that was not the case, here. It seems questionable, to me, that the agencies which were called upon to respond to the Trump rally, did so under mutual aid requests. The Deputy Director of the Whatcom County Sheriff’s Office Division of Emergency Management, John Gargett, had informed me that all the agencies which supported the Trump rally effort did so under mutual aid requests. Whatcom County Code 2.40.120 addresses the concept of a mutual aid agreement. After reading that particular code, it caused me to wonder if it was even appropriate to use the Law Enforcement mutual aid agreement for the May 7 Trump rally in Lynden. From what I can tell, with limited knowledge in the matter, the concept of mutual aid seems to be intended for emergency situations such as big fires, natural disasters, etc. The Trump rally was a planned event, albeit a planned event in about a two-day period. I believe a strong case could be made for seeking reimbursement from the City of Lynden and the Northwest Washington Fair Association for the expenses our County government will have to bear, resulting from the actions of both the City and the Fair Association in having brought the Trump rally to Whatcom County. The decision-makers involved could have ensured that the expenses for law enforcement and emergency personnel needed for such an event, would be covered by the Trump campaign and/or the Northwest Washington Fair Association. S.R: (1) What entity/entities are responsible for the expenses related to the response necessitated by Trump’s visit to Whatcom County? (2) Have the total expenses related to the response necessitated by Trump’s visit to Whatcom County been tallied yet, and if so, what is that figure? (a) If not yet tallied, when is that final tally expected to be completed so that I may have access to that figure? Gargett: With respect to your questions, at this point all agencies who supported the effort did so within their own financial resources under mutual aid requests, however the feasibility of reimbursement and/or request for compensation is being evaluated by the County. Total costs are being tabulated and we do not as of yet have a final timeline for gathering, tabulating and publishing that data as I am sure you can understand that it takes quite a lot of time to gather all that data. We have, however, reached out to all agencies and requested their information. Could you please explain a few things for me about your answer so I can understand exactly what you meant? (1) What do you mean when you wrote, “under mutual aid requests”? Gargett: 1. Law Enforcement and the Fire Communities have established formal agreements to support one another as needed during events. For example, last summer the fires that were burning state wide required fire fighters from all over the northwest. They were activated under mutual aid agreements. The Whatcom County Sheriff’s Office used Law Enforcement mutual aid for the Trump rally. What is the difference between “reimbursement” and “request for compensation”? Gargett: 2. This has two pieces. First, “feasibility of reimbursement” – traditionally no candidate, office holder or other high profile VIP expects to pay for local security, hence the question being asked is it even feasible for us to expect reimbursement? Second, if we as a County believe it is feasible, then who do we request the compensation from? – The Lynden Fair contracted with the Trump Campaign, but it was the Secret Service that requested LE support. So simplistically, is it feasible to even bother with trying to get reimbursement, and if it is feasible who do we send the bill to? S.R: (3) When you wrote “…the feasibility of reimbursement and/or request for compensation is being evaluated by the County,” does that mean other agencies that responded to Trump’s visit to Whatcom are evaluating the feasibility of reimbursement and/or request for compensation from Whatcom County, or does it mean Whatcom County is evaluating whether it can seek (feasibility) of reimbursement and/or request for compensation from other agencies or entities? While I understand it does take some time to gather and tabulate the data, it does seem as though in order to pay personnel in a timely fashion there would need to be a tabulation of some kind within about a week or two so that those personnel who were working as responders relating to Trump’s visit to Whatcom can be compensated. I do understand there would be a need to receive that data from all involved agencies so that could take a number of weeks though. Gargett: All personnel are being paid from existing budgets, they will receive overtime and regular pay as normal. S.R: So, for now, I would imagine that Whatcom County has to tabulate its expenses in terms of its own responder personnel utilized in order to compensate them. I would hope to at least to get an understanding within the next couple weeks as to the cost, so far, incurred by Whatcom County for its own responder personnel. Is my thinking unrealistic here? Gargett: Your thinking is not incorrect, and again, all personnel are being paid out of existing budgets. (4) Does that mean you have requested the information from the other agencies which sent responders to Whatcom in terms of the costs they incurred relating to Trump’s visit to Whatcom? Gargett: Yes, our office has requested the information from all agencies and that is starting to come in, but it will be (as you said) probably a number of weeks. S.R: (1) When was the very first inquiry about, or mention of, the possibility of Trump coming to Whatcom/Lynden made with Whatcom County Sheriff’s Office Division of Emergency Management? (2) Who or what entity made that initial inquiry about, or mention of, the possibility of Trump’s visit to Whatcom/Lynden with Whatcom County Sheriff’s Office Division of Emergency Management? Gargett: All I can tell you is that (because it is all I know) we first started hearing potential rumors Wednesday night. However we were not told it was happening until late Thursday afternoon. That is when we started the planning. I do not know who or what entity made the initial contact with the Sheriff’s office. As far as weeks before, I heard that KGMI radio reported on the news while interviewing local Trump supporters who organized it (Doug Erickson I think) that the KGMI reporter had been told about it weeks before. As I did not hear the interview I do not know who did the interview or for sure who was interviewed, or if in fact that was actually said. I am sorry I cannot be of more help, I really am not sure. I tried to find out information online about the Law Enforcement Mutual Aid agreement that Whatcom County operates under or with, but could only find information about the Law Enforcement Mutual Aid Team (LEMART), which I’m thinking may be different than Law Enforcement Mutual Aid agreement. Can you please send me the information, or the online link to the information, about that mutual aid agreement? I’d like to know the situations under which that type of mutual aid agreement can be used. Gargett: Let me see what I can find for you. It may be the LEMART agreement but I will reach out to the Sheriff and Undersheriff. Also, as of yesterday, the costs that have been turned in by just local agencies is 130,500. We have not gotten any costs from any non-Whatcom County agencies yet, but I have been told they are working on it. Follow-up questions in my May 20, 2016 email to Gargett with his responses from his May 20, 2016 email reply. S.R: I apologize for not asking you these questions in my earlier email to you when you had sent me an update on the expense tally, but I just came across this information from Whatcom County Code (copied and pasted below), which caused me to have two additional questions. A special pooled fund shall be established in accordance with Chapter 38.52 RCW. It will be known as the Whatcom County emergency management fund and will be administered by the Whatcom County sheriff’s office. All moneys, assets and liabilities of the department of emergency services as of December 31, 1989, shall be transferred to the Whatcom County emergency management fund. (Ord. 89-115 (part)). All contracts, agreements, rights, claims and obligations, either in favor of the department of emergency services or against it at the time the ordinance codified in this chapter takes effect shall continue in full force and effect. (Ord. 89-115 (part)). S.R: (1) Will the expenses incurred by the County for the Trump visit/rally be paid out of the Whatcom County Emergency Management Fund? Gargett: No, these are coming out of general overtime funds is my understanding. S.R: (2) How does the County pay for its EMS expenses? In other words, do those funds come from a budget or fund, and what is the name of that? Gargett: The County and the City share EMS costs under the Whatcom Medic One Emergency Medical Services, also known as Whatcom Medic One. Whatcom Medic One is administered and operated by the City of Bellingham through an interlocal agreement with Whatcom County government. S.R: Can you please provide me an update on the expense tally? Gargett: I am actually out until Tuesday but the last number I heard was 140,000. Gargett: I just saw that the paper today gives a total of 155,000. Sorry for the 140,000 figure. I have been out of the office. S.R: I looked in my email folders, however I do not see a response from you to my May 20 email forwarded below in which I asked for information on, or an online link to, the information about the mutual aid agreement referenced. Can you please help me with that? I was hoping to have that information a week ago. I am still waiting for Gargett’s response to my May 27, 2016 email. Screenshot photo of Washington State Senator Doug Ericksen’s (R-Ferndale) May 8, 2016, Facebook post. Ericksen is shaking Trump’s hand. 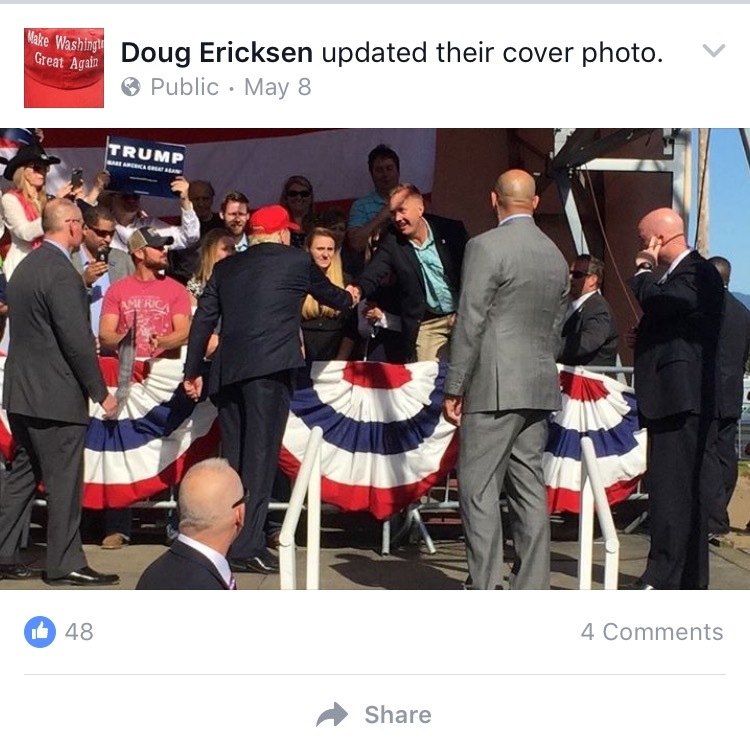 Senator Ericksen is the Deputy Director of Donald Trump’s campaign in Washington state, and was the apparent connector that brought the Trump campaign to Whatcom County. Attempting to delve into Trump’s campaign having chosen the little-known border town for a political rally, I called Senator Ericksen the week of May 9th, to find out more on that subject. S.R: Is my understanding that you were instrumental in bringing Trump to Lynden, correct? S.R: So, you had no involvement at all then? That was the sum of my conversation with Senator Ericksen. The Northwest Washington Fair is owned by the Northwest Washington Fair Association, which according to the Washington state Secretary of State website, is a non-profit organization. Jim Baron, Northwest Washington Fair Manager. Photo is from the Northwest Washington Fair website. I called Jim Baron on May 11, 2016 to ask him a couple questions about the May 7, 2016, Trump rally held at the Fairgrounds. S.R: I wondered when you/the Fairgrounds were first contacted about the possibility of holding the Trump rally at your facilities? Baron: The discussions that we had with the organization, and the planning is a private matter. It’s not something I’m going to discuss publicly. I explained to Baron that I wasn’t asking for any negotiation details, etc., that I just wondered when he was first contacted about that. S.R: So you’re just not able to speak about that? Baron: I’m choosing not to. I’m able, but I’m not going to discuss the negotiations and discussions that we had. S.R: When the Fairgrounds has an event like the Trump rally, which is a large and controversial event, is that something the Northwest Washington Fair Association’s board would have to vote on? Baron answered that from a management standpoint, the Fairgrounds has ongoing rentals all the time. They have a director of rental facilities in addition to himself, as manager, so those decisions don’t go to the board of directors. Baron: The rentals that the Fair is routinely involved in are handled by the staff of the Fairgrounds—and not by the board of directors. 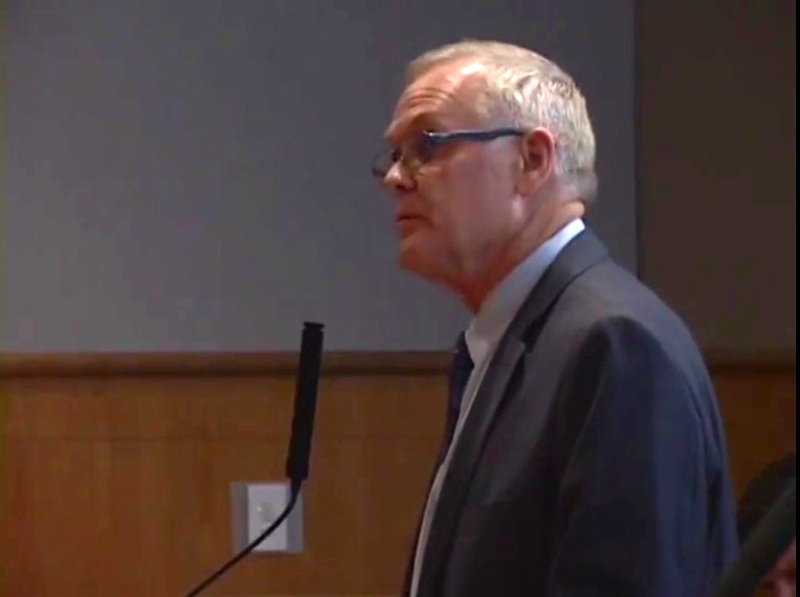 Whatcom County Executive Jack Louws speaking at the October 27, 2015, Whatcom County Council meeting in Bellingham, WA. Louws was defending his actions that led to over $44,000 of County funds to be used for the controversial 2015 new County jail mailer, sent to most Whatcom County registered voters in October, during the 2015 general election. SR: (1) When were you first made aware of the possibility, not necessarily definite, that Donald Trump’s campaign was looking into the potential of a Trump rally being held in Whatcom County? S.R: (2) Who was the individual or individuals who informed you of this? S.R: (3) When were you made aware of the fact that Donald Trump’s campaign had selected the NW Washington Fairgrounds in Lynden to hold the May 7 Trump rally? S.R: (4) Who was the individual or individuals who informed you of this? S.R: (5) Was it necessary that you, as County Executive, give some type of approval or “okay” to move forward with holding the Trump rally in Whatcom County? Louws: No, the Northwest Washington Fair is located in the City of Lynden, and by Lynden ordinance it is exempt from obtaining special permits for events held on the grounds. S.R: Since it was not necessary that the County Executive give some type of approval or “okay” to move forward with holding the Trump rally in Whatcom County since by Lynden ordinance, the NW Washington Fair is exempt from needing special permits for events held on the grounds, did Jack Louws still register/communicate either his approval/endorsement, or disapproval, of the event to Sheriff Elfo who informed him of the Trump rally coming to Lynden? Louws: I have continually expressed my concern that law enforcement was put in a predicament to protect the community within a very short time frame. My view has been expressed to the Sheriff and other elected officials. I also communicated to both the Mayor and Police Chief of Lynden that they may want to engage their council, and reconsider the exemption of the Fair from their events permit. 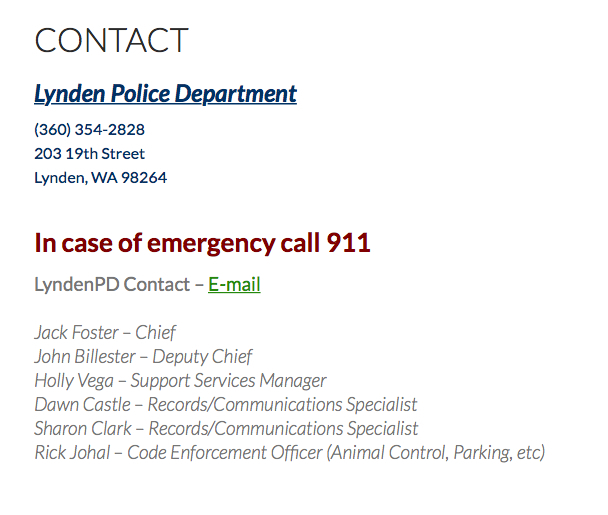 I called Lynden Police Deputy Chief John Billester on May 18, 2016, to find out more information about the May 7, 2016, Trump rally. From notes I took, this is my best recollection of that conversation. In our phone call, Billester told me that Senator Doug Ericksen had first contacted Lynden Mayor Scott Korthuis, about the Trump rally coming to Lynden. I asked Billester if my understanding was correct that the Lynden Police Department wasn’t contacted directly, initially, about the fact that the Trump rally might be held in Lynden, and that actually, Senator Doug Ericksen had contacted Mayor Korthuis, and it went from there. Billester: Right. That’s my understanding, yes. I then asked Billester what the next step was once Mayor Korthuis had been contacted by Senator Ericksen. Billester: Well, the first thing was, they [Trump campaign] needed to secure a contract with the Fairgrounds, so the Lynden Police Department, still at this point, is not involved. According to Billester, the Lynden Police Department was not involved until after the contract between the Northwest Washington Fair Association, and the Trump campaign had been secured. This caused me to wonder how a contract can be secured for an event such as the Trump rally, without the Northwest Washington Fair Association having gotten assurances, up front, from the Lynden Police Department, in terms of its capabilities to protect the public. Billester: Once the contract was secured, that’s when Mayor Korthuis was told that it looks like the rally would happen—because for part of that day, Thursday (May 5th), things had still been up in the air. He went on to say that evening, Thursday the 5th, around 5:00 pm, at the end of a Public Safety Committee meeting with some of the Lynden City Council members and the mayor, Korthuis let them know the Trump rally was, in fact, going to happen. I told him I had been curious about that because I had heard Dillon Honcoop’s April 25th KGMI Morning Show, on which, Senator Ericksen was a guest, and he told Honcoop about the possibility that Trump was looking at Whatcom County, so I wondered if Mayor Korthuis, or the City of Lynden, or the Northwest Washington Fair Association, or the Lynden Police Department, were contacted even earlier than what it sounds like Deputy Chief Billester said, which was Thursday, May 5th. Billester said they (Lynden Police Department) had no prior knowledge that Lynden was a potential location for the Trump rally. I asked Billister what the Police Department’s next move was after they had been informed at the Public Safety Committee meeting, ‘we’re comin,’ as I wondered if that next move was to contact the County Sheriff, since Lynden is a small city and there are not very many police officers (Lynden has 14 or 15 officers). Billester: In that loop, which I was not part of, nor was Chief Foster, he was getting his information from Mayor Korthuis. In the Senator Ericksen–Mayor Korthuis loop, was also Sheriff Bill Elfo, because he’s the chief law enforcement agent in the County…So, he [Elfo] was in that loop with the mayor and Doug Ericksen. Billester explained that even though the primary jurisdiction was the City of Lynden, it’s also within the Sheriff’s Department jurisdiction, so knowing that, there would be 3 venues; the Bellingham airport, the Fairgrounds, and the motorcade between those points. He added that Sheriff Elfo was in that loop with Mayor Korthuis and Senator Ericksen, and clarified for me that Elfo was in the know from the beginning. Billester: If you look at the jurisdictional situation that we had, the City of Lynden couldn’t handle that on our own. We don’t have enough resources or personnel to do it—so mutual aid just kicked-in at that point. Expounding on the idea of mutual aid, saying that if the City of Ferndale today had a school shooting—it’s overwhelming, they can’t handle it on their own, the Lynden Police Department would just go—the Sheriff’s Department would go. Or if a plane crashed into a school in Ferndale, the Lynden Police Department would go, explaining to me that mutual aid automatically is then kicked-in, and the law enforcement agencies just go help. Billester: So, the Trump rally is no different, it’s just a little different situation, this was one where it was more a security situation and enforcement. I responded, giving my reasoning from a citizen’s perspective, that there seems to be a difference, wherein the Trump rally is not necessarily an emergency situation, it’s something law enforcement would know ahead of time as it is a planned event, and the other situations he had described are more reactions to emergency situations. Billester: I would say it’s not an emergency, it’s emergent. Differentiate between emergency and emergent. Emergent is we have to do something right now. Emergency is, it’s already happened. Deputy Chief Billester told me that once they knew the Trump rally was happening, they met the next morning, Friday, May 6th, at the Emergency Operations Center with all the agencies, local agencies that were going to be involved to get the planning going. S.R: (1) When were you first made aware of the possibility, not necessarily definite, that Donald Trump’s campaign was looking into the potential of a Trump rally being held in Whatcom County? Elfo: I received a call from the Trump campaign staff in the late afternoon of May 4th that the Lynden Fairgrounds was being considered as a venue for the Trump rally. I contacted the United States Secret Service in Seattle on the morning of May 5th . The Secret Service advised that it was not likely that the rally would be held in Lynden and would rather likely be held in Everett. The Secret Service subsequently notified me about 3:30 p.m. on Thursday that the rally would be held in Lynden on May 7th. S.R: (5) Was it necessary that you, as County Sheriff, give some type of approval or “okay” in order to move forward with holding the Trump rally in Whatcom County? Elfo: No – the Fair Grounds are within the City of Lynden – it is my understanding that the City does not require permits for events held at the Fair Grounds. I did express reservations regarding the ability to effectively prepare, plan for and ensure adequate staffing on short notice. S.R: (6) If in fact, it was not necessary for the Sheriff’s office to give some type of approval or “okay” to move forward with holding the Trump rally in Whatcom County since by Lynden ordinance, the NW Washington Fair is exempt from needing special permits for events held on the grounds, did you still register/communicate either your approval/endorsement, or disapproval, of the event to the person or persons who informed you of the Trump rally coming to Lynden? Elfo: No. Nor was I asked for my opinion, approval or endorsement. It would be inappropriate for me as Sheriff to approve, endorse or disapprove a political event. I was simply informed that that there was a possibility that the event would take place at the Lynden Fair Grounds. Other law enforcement agencies experienced in providing public safety at presidential campaigns estimated that 500-600 officers would be needed to secure the venues, maintain order and public safety, and protect the constitutional speech and assembly rights of all. The Lynden Police Chief-in whose primary jurisdiction the event was held- reported that he had 10 officers available and requested my assistance. I assisted the Chief by providing staff, engaging in planning and gaining commitments from agencies both in and out of Whatcom County to provide additional assistance. S.R: (1) When you say you communicated reservations, can you tell me who was the person, or persons who you communicated those reservations to? S.R: (2) Did you communicate any reservations about either what you stated below, or the financial cost to the county for such an extraordinary level of service necessary? S.R: What is most puzzling to me after learning more about the Trump event, is that a private venue such as the NW Washington Fair could have signed a contract for an event where everyone knew there would be the need for a huge law enforcement presence, without any assurances (pre-signing) from our county executive, or yourself, as the highest law enforcement agent in our county, or the Lynden mayor, or the Lynden Chief of Police. S.R: (3) Can you please explain how that is possible? S.R: It seems quite unfair that a private business can receive a fee for renting their Fair facilities for an event that would require extraordinary law enforcement service and that business not then reimburse the county and cities for law enforcement service needed for that high profile event. Elfo: IT WOULD MAKE SENSE TO ME that VENUES RENTING FACILITIES FOR AN EVENT SHOULD BE REQUIRED TO COLLECT SUFFICIENT FEES TO PAY FOR THE LAW ENFORCEMENT/FIRE/AND OTHER GOVERNMENT SERVICES NEEDED TO ENSURE PUBLIC SAFETY AT THAT VENUE AND BUILD THOSE COSTS INTO ITS FEE STRUCTURE. HOWEVER, APPARENTLY LYNDEN HAD NO APPLICABLE ORDINANCE TO REQUIRE THIS. GIVEN THE SHORT NOTICE AND THE PROPENSITY FOR DISORDER, IT WAS NECESSARY TO PROCEED TO PLAN FOR AND EXECUTE STRATEGIES TO ENSURE THE SAFETY OF ALL PERSONS AS WELL AS THE CONSTITUTIONAL RIGHTS TO ASSEMBLY AND SPEECH. S.R: (4) Can our County Sheriff’s department seek reimbursement from either the NW Washington Fair Assoc., or the Trump campaign for those expenses incurred? Elfo: WE ARE CURRENTLY COLLECTING a TALLY of the COSTS INCURRED by WHATCOM COUNTY and the OTHER AGENCIES that ASSISTED. The WHATCOM COUNTY PROSECUTING ATTORNEY has INDICATED THAT HE WILL REVIEW this and DETERMINE if the COUNTY CAN SEEK REIMBURSEMENT FOR ITSELF and on BEHALF of OTHER AGENCIES. In trying to find more information about Whatcom County mutual aid agreement, I came across Whatcom County Code 2.40.120. Below, I copied an excerpt from that full page of content. Elfo: WHATCOM COUNTY PROVIDES EMERGENCY MANAGEMENT SERVICES TO THE CITY OF LYNDEN BY WAY OF AN INTERLOCAL-AGREEMENT. PLANNING FOR LAW ENFORCEMENT AND FIRE SERVICES AT SUCH EVENTS ARE WITHIN THE SCOPE OF THIS AGREEMENT. S.R: I’m not saavy in this area, so I do not know if this is the applicable “mutual aid” that Mr. Gargett was referring to in his response. Elfo: THE REVISED CODE OF WASHINGTON MUNICIPAL POLICE POWERS ACT PROVIDES FOR EXTRATERRITORIAL JURISDICTION AND MUTUAL ASSISTANCE FROM LAW ENFORCEMENT AGENCIES. THE SHERIFF IS LEGALLY OBLIGATED TO ENSURE LAW AND ORDER IF A MUNICIPAL IS UNABLE TO DO SO. LYNDEN HAD ONLY 10 OFFICERS AVAILABLE. AS SHERIFF, I WAS OBLIGATED TO ASSIST. S.R: I’m not sure, but from what I read in that particular code, it caused me to wonder if it was appropriate to use the Law Enforcement mutual aid agreement for the May 7 Trump rally in Lynden. Elfo: YES, IT WOULD HAVE BEEN INAPPROPRIATE, IMPRUDENT AND IRRESPONSIBLE NOT TO RESPOND TO A POTENTIAL THREAT TO PUBLIC SAFETY AND DISORDER. DESPITE POTENTIAL ARGUMENTS RELATING TO COSTS, WE HAD VERY LITTLE NOTICE OF THIS EVENT AND A HUGE RESPONSIBILITY TO THE PUBLIC IN TERMS OF PUBLIC SAFETY AND THE PROTECTION OF CONSTITUTIONAL RIGHTS TO SPEECH AND ASSEMBLY. S.R: From what I’ve read so far, that mutual aid agreement seems to be intended for emergency situations such as big fires, natural disasters, etc. The Trump rally was a planned event, albeit a planned event in about a two-day period. I can’t find anything online about Whatcom County Law Enforcement mutual aid agreement in terms of detailed guidelines, rules, etc., so I emailed you this morning, asking where I can learn specifics about the Law Enforcement mutual aid agreement. Chapter 2.40 EMERGENCY MANAGEMENT. Sections: 2.40.010 Definitions. 2.40.020 Division established. 2.40.030 Director appointed. 2.40.040 Division staff. When you say you communicated reservations, can you tell me who was the person, or persons who you communicated those reservations to? (1) Did you communicate those reservations before or after the contract with NW Washington Fair and the Trump campaign was official/signed? It seems like the NW Washington Fair Assoc. would have needed official confirmation from your department if there would be protection provided that would be needed for such a huge event. Elfo: I had no communication with anyone from the Fair. The Fair is within the City limits of Lynden and Whatcom County does not have the authority to regulate gatherings within the city limits (but we do have the authority to enforce the criminal law). I did convey my concerns about providing adequate planning and security on short notice. (2) Can you please provide a link to the actual interlocal agreement between the city of Lynden and Whatcom County outlining that Whatcom County provides EMS to Lynden that you are referencing? S.R. (3) And can you point out the page number in that agreement on which it states that events (such as the campaign rally) would be within the scope of that agreement? I have searched online for “MUNICIPAL POLICE POWERS ACT,” but I can not seem to locate that specific Act. (4) Can you please cite where I can find that specific Act so I can review it? I said in my previous email that I wondered if it was appropriate to use the Law Enforcement mutual aid agreement for the May 7 Trump rally in Lynden. I had said that because in reading the Mutual Aid agreement RCW, it appears to be intended and used for disasters such as wildfires, floods, etc., and the Trump rally does not seem to fit those types of situations. First, to be clear, I am not suggesting that your law enforcement department should not have provided protection service for the public. Rather, I am questioning the fact about whether the Trump event could be considered a disaster or emergency situation for which it seems that the concept of “mutual aid agreement” was/is intended. And, I question whether using the justification that the NW Washington Fair is exempt (by Lynden ordinance) from being required to secure a permit for events, should have allowed either the NW Washington Fair, or the Trump campaign, to be released from the responsibility of ensuring that Whatcom County Sheriff dept., local city law enforcement agencies involved, and the County Executive, sign off on such an event—possibly even the County Council too. And, arrangements for reimbursement for necessary law enforcement protection should be agreed upon before any official agreement with the parties wishing to hold and host such an event would be agreed to and signed. Otherwise an event as high profile as Trump’s rally, necessitating such a large number of law enforcement responders, could cause a county or city to suffer serious negative financial consequences. I request that you and your department do everything in your power to seek reimbursement for this huge expense foisted upon our county and its taxpayers, by the Trump campaign, and the NW Washington Fair Assoc. S.R: I urge you to request that the County Executive, and the County Council, demand that our County Prosecuting Attorney seek reimbursement for expenses incurred to our County from the Trump rally in Lynden. Elfo: Again, the Prosecuting Attorney is reviewing. S.R: I look forward to receiving the information, or links to where I can find that information you said you will be getting to me. In the meantime, I have several questions regarding one of your responses below. Your response didn’t appear to me to answer the question I asked. –Could you please provide me a response to my question? Since Whatcom County/you as the County Sheriff, has the authority to enforce the criminal law, then it seems that Whatcom County/you as County Sheriff, should have authority to make the decision whether the law enforcement agencies under your authority (which I believe includes not only Whatcom County Sheriff’s office but also the cities’ law enforcement agencies within the County) could provide the extraordinary protection/security necessitated by such a huge and unusual event as the Trump rally. –Is my thinking correct on this point? –So, since it sounds like you did not communicate with anyone from the Fair, did you/your department communicate with Mayor Korthuis, Senator Doug Ericksen, or anyone else involved with planning the Trump rally and provide confirmation that there would be ample protection/security provided by Whatcom County Sheriff dept. and other cities, that would be needed for such a huge event? –If so, was that communication before or after the contract was signed between the Trump campaign and the Fair? I am still waiting for responses from Sheriff Elfo to my questions in my June 1, 2016 email. I called the City Administrator for the City of Lynden, Mike Martin, on June 2, 2016, to ask some questions about the Lynden ordinance, that according to an email I received from Whatcom County Executive Jack Louws, exempts the Northwest Washington Fair “from obtaining special permits for events held on the grounds.” From notes I took, this is my best recollection of that conversation. I explained to Martin that I had looked up Ordinance No. 1141, approved by the Lynden City Council in 2002, which amended the Lynden Municipal Code (LMC). I told him I was specifically interested in section “9.32.020 Permit-Required-Exceptions,” letter B, under which six exceptions are listed. Number 6 is, “The Northwest Washington Fair.” It is listed as being exempt from needing to obtain a special events permit. The language in the code does not use the terms “Fairgrounds,” or “Fair Association,” so, I said it leads me to believe the intent of that ordinance was to exempt the annual Fair itself, not every single event throughout the year that would be held at the Fairgrounds. S.R: In terms of that exemption, as far as I can read that, it seems like it’s referring to the Fair itself, so any other time of the year, except during the annual summer Fair, do events held at the Fairgrounds need to have a permit? Martin: You’re probably thinking of the Trump rally thing? I explained to Martin that my specific interest definitely relates to the Trump event, as County Executive Jack Louws had told me in an email that there was a permit exemption by ordinance for the “Northwest Washington Fair.” And, I expressed to Martin that as far as I can tell from reading about the exemption in the LMC, it seems like that was intended for the Northwest Washington Fair. I asked him if there are other times during the year, not counting the week of the annual Fair, that activities/events held on the Fairgrounds are not required to have permits. Martin acknowledged that he had asked himself the same question when the Trump rally came up, and admitted he wasn’t quite sure what to make of that particular exemption. Martin: Never in our history, that I’m aware of, certainly not in the brief period I’ve been here (about three years), have we ever required a permit for an event that took place on the Fairgrounds. Martin elaborated, saying the only exception to that would be a 16th [I think he meant “15th”] birthday celebration for Latinos [I believe he was referring to a quinceañera] that a person or group had wanted to hold at the Fairgrounds. Martin explained that the city would require a permit for that because there is alcohol and dancing in the same place which necessitates a waiver. Martin: But, beyond that, that’s kind of a very unique category. In direct answer to your question, we’ve never required permits for any events that have gone on at the Fair, ever. I asked Martin if he was involved in the Trump event, in terms of someone checking to see if a permit would be required for the Trump event. He said he was asked about the idea of whether a permit for the May 7th Trump rally would be required, so he looked at the same section of the LMC as I had, and asked the same questions I had. Martin told me what “tipped it” for him was the fact that if the city were to have required a special events permit for the Trump rally, it would have been contrary to the precedent that’s been set over what he thinks to be decades. Martin: We never required that before, and I couldn’t think of why we might require it of him [Trump] and not all the other events. I told him I understood that, but I reasoned the Trump rally is such an extraordinary event in terms of the law enforcement and emergency services that would be needed compared to those other events over the last decade or so that were hosted on the Fairgrounds, so that made me wonder about that exception he mentioned where there would be alcohol and dancing, which seemed to make that event (the quinceañera) unique. I asked him if a case then could be made that the Trump event is different too, because it would require an extraordinary use of law enforcement personnel. Martin clarified that the reason Lynden requires a permit for drinking and dancing is because the LMC speaks specifically to that—it says you cannot have that unless you get a permit. Martin: The Trump thing, you make a fair point, about how doesn’t that feel different than an equestrian show, or like a Good Sams, and it feels different to me, but we don’t have any criteria that would put it in a different category. I said I wondered that even if the LMC, as it is currently being interpreted, supposedly exempts all events at the Fairgrounds, could the City of Lynden say, ‘wait a minute, can we actually protect this event we’re allowing in our city?’ I explained that, to me, that seems like it would not be about discrimination, but rather, would be about if the city can afford to properly protect people for this event. I asked Martin how they deal with that kind of argument that could be made. Martin: For me, personally, regardless of whatever our code or statute said, if there was an event that would create a danger to the community we would stop it, because that kind of trumps everything. He explained that in the case of the Trump rally, the city knew from its Police Chief that there would be hundreds of other officers involved in the event—they were not relying on their own city officers to protect the city. Martin said the City of Lynden was a very small part of the whole plan there. I queried Martin about what happens when the Northwest Washington Fair Association holds events during the year (other than during the week of the annual Fair), and those events might necessitate more law enforcement involvement or traffic control—and asked him if the expenses for those law enforcement personnel are then something the Northwest Washington Fair Association covers, or are those costs something the City of Lynden typically has to absorb. Martin replied that he knows the Northwest Washington Fair hires City of Lynden Police officers on an off-duty overtime basis to help protect the Fair when it’s underway. Martin: It wouldn’t surprise me if there’s that kind of arrangement for other events, but those events are not so prominent, that I’m aware of them. I’m not saying it doesn’t happen. He then brought up that back in April, the rap star Snoop Dogg, was coming to town and that his people said “we’re coming to the Fair, we’re gonna celebrate 420”, which Martin described as the day on which people celebrate marijuana. Martin: So, we knew there was gonna be a ‘gangsta’ appearance—We knew there was going to be music involved—We were told there was alcohol involved—We were told there wouldn’t be any dancing per se, but you know how likely that’s not to happen. He said the city was also told by the people calling on behalf of Snoop Dogg, they could ensure there would be no alcohol or marijuana smoked inside the stadium where they were going to have the event, but they couldn’t control the parking lots. Martin: When we heard about all that, we just together thought, ‘recipe for disaster’—there was no way we could possibly make this fit our community. We said this is not gonna work. There’s gonna be dancing, there’s alcohol—we know it’s gonna happen—you know it’s gonna happen, you’re just gonna have to go somewhere else. I asked Martin if Snoop Dogg et al. could have simply gotten a permit like he said the person/group wanting the quinceañera event would have had to obtain because there would be dancing and liquor at that event. He responded, saying, they might have been able to get a permit, but pointed out that on a permit there’s all kinds of conditions, and you have to tell or show how you’re going to maintain control over the event—there was just no way they could do it. Martin said the city knew they (event attendees) were going to be smoking pot in a city in which the City Council had just approved a moratorium. He expressed that the Snoop Dogg event is an example of an event that city officials just could not imagine could possibly be safe or secure. When Martin mentioned the moratorium, I believe he was referring to the vote earlier this year by the city council on March 21, 2016, to permanently ban the growing, processing, and selling of marijuana for recreational and medical use. However, I’m not sure that I see a direct correlation in terms of the intent of that moratorium to Snoop Dogg et al. wanting to hold a 420 celebration event at the Fairgrounds. Martin: Because we would be relying on our police force, to take care of all the hundreds or more people coming and going, stoned, all that, and we just knew it would be a safety risk, so we made the call. Martin added that with the Trump event, because the people who contacted the city first were law enforcement; the CIA, the FBI, all those kinds of agencies, it was understood there would be hundreds of law enforcement officers there, so the city felt that it would be adequately protected. I asked him if when he had stated that law enforcement had contacted him, was it Sheriff Elfo and the other agencies he had mentioned, or just the secret service, or FBI, etc. Martin: It was our Police Chief [Jack Foster]. Martin: Yeah, it was kind of organic…they immediately set up the Office of Emergency Management…with all the agencies, and they treated it like an incident command. He explained that the City of Lynden didn’t expect its police officers to be able to protect the Trump event, but the city had reason to believe that there were other professionals who were going to be working with them on that. I told Martin that I was interested in revisiting the earlier part of our discussion relating to the Snoop Dogg event he had mentioned to me that the city had not allowed because city officials felt that they could not control that situation because there were not enough city police officers, etc. I asked him if that is a situation where they could have used the various law enforcement agencies like those used for the Trump rally. Before he could answer, I elaborated, asking him if the Fairgrounds could have hired extra law enforcement and security like they do for the Fair. Martin: I’m going to have to go, but to answer your question, the federal government was not going to be willing to pay for Snoop Dogg to come to Lynden—you know, pay for security for that. S.R: But we are willing to pay for Trump? This entry was posted in Blog Post, Commentary, Information and tagged Bill Elfo, Donald Trump, Doug Ericksen, EMS Expenses, Event Permits, Feasibility of Reimbursement, Jack Foster, Jack Louws, Jim Baron, John Gargett, Law Enforcement Mutual Aid Team, LEMART, Lynden, Lynden Police Department, Mike Martin, Mutual Aid, Mutual Aid Agreement, Northwest Washington Fair Association, Northwest Washington Fairgrounds, November 2016 Presidential Election, Reimbursement, Request for Compensation, Whatcom County, Whatcom County Emergency Management Fund, Whatcom County Executive, Whatcom County Sheriff's Office, Whatcom County Sheriff's Office Division of Emergency Management, Whatcom Medic One. Bookmark the permalink.